I need some help and I’d appreciate if you could help me. My theme does not allow me to install a very simple plugin called Google Tag Manager. I need this plugin to be installed in my website to have the consumers tracking. Mautic is going to connect with this plugin to help with this task. When the plugin Tag Manager is active, my website does not open its pages correctly. I really appreciate your help. Have a nice weekend! Are you talking about this exact plugin? That's an old plugin and the last update was a year ago. So I can tell why is not working exactly. That's strange you should use the code without problem. Can you send me a WordPress user and the code from Google Tag Manager in a private reply? I will take a look at the site to see what's happening. I added the plugin "Google Tag Manager for WordPress" and now the code for Google Tag Manager is working on your site. Hello, sorry to insist on the same problem. It continues to generate a problem on the site. I ask you to view the site after installing the plugin. Maybe the configuration on your Google Analytics has the wrong URL. 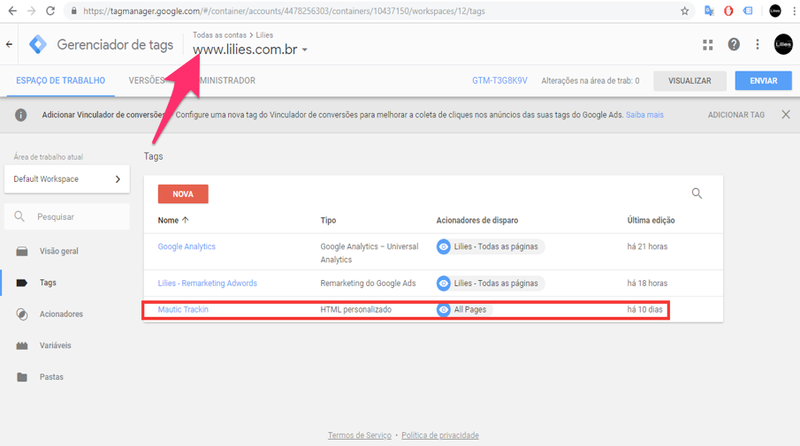 Because looks like is configured for the domain "'https://mautic.lilies.com.br" and it is a different subdomain. Can you check that configuration? The problem is that your script is making the request from another subdomain. And that's blocked. But you are sending requests from "mautic.lilies.com.br" and there is a thing called CORS which on some server doesn't allow to receive requests from different domains. This is for security. Unfortunately I can't help you much because this is not a theme related issue. You should try asking on the support for those two services. Thanks to you, let me know if you need anything else.